Evernote’s cool and easy-to-use features can transform your workflow and content creation strategy. Evernote was designed to create notes in a breeze, but it goes beyond that. When used right, this app can help you stay organized and improve your workflow. Here’s how you can use Evernote as a powerful tool for creating content. Social media updates and trends are great sources. They give you new topics to discuss and questions to answer. You can also use them for your website and share them with your audience when you run out of original content to post. To organize your social media finds, you can create a notebook on Evernote for Twitter, Facebook, and Instagram updates. Add any type of update here using hashtags, stacks, and links. This makes the updates easier to find when you need them. You can do the same with stock photos as well. Create a stock image library on Evernote and add the beautiful photos you see on the web. Another great tool you can try is Evernote’s Web Clipper or extension that you can install in your browser. It lets you save the articles and sources you find with one click. You can create a ‘read later’ notebook for this, so you can avoid breaking your workflow. It’s wise to set a default notebook where you can quickly store notes. To set a default notebook, right click on any of your notebooks and select ‘Notebook Settings’. Then check the option ‘Make this my default notebook’. You can write your articles, blog posts, or random musings on Evernote. This is great for writing your drafts because you can jot down all the important information while you’re reading. You can even replace your journal and go paperless by writing your to-do lists on Evernote. Too tired or not in the mood to write lengthy paragraphs? Create a note by using a microphone. Simply click on the little microphone icon and record your thoughts. This is great if random ideas hit you while you’re commuting or on a vacation. You can share notes to your team like meeting agendas, reports, design ideas, and other articles you found on the web. You can either use Work Chat or email the note to them. To use Work Chat, click the Share button to pop-up the Work Chat window. Type the email address of the person you want to share the note with. Then set the permission level to ‘Can edit and invite, ‘Can edit’, or ‘Can view’. Type your message, then tap Send. To send notes via email, open the note and click the Share button. Then type the names or emails of the persons you want to share the note with. Also, Evernote Premium and Evernote Business both have Presentation mode. This feature allows you to present your notes with a group of people. This works best for meetings and brainstorming sessions. To present your notes, select Presentation mode (projection screen) button at the top of the note you want to show them. Then scroll up and down through the entire note. Presentation mode also expands your note to the dimensions of your monitor so your group can see the texts and images clearly. You can customize your presentation using Evernote’s layout editor. It lets you divide long notes into smaller sections, and increase the font size of your texts. Do you want to organize your email inbox? You can save emails into your Evernote such as travel reservations, weekly reports, or newsletters. This gives you the ability to access them everywhere. To do this, you need to find your Evernote email address first. If you’re using Evernote for Web, click on your profile photo, then select Settings. You’ll see your email address in the ‘Email Notes’ section. For Android users, tap the three dots button in the upper right, select Settings, then Account Info. Scroll down until you see your Evernote email address. For iPhone and iPad users, select the Account tab, tap Settings, then Evernote Email Address. Once you have your Evernote email address, open the email you want to save, then forward it to your Evernote address. Your email will appear as a new note in Evernote that uses the email subject line as the title. You can subscribe to newsletters using your Evernote email address, too. The newsletters will go straight into your Evernote and won’t swarm your inbox. Do you use Post-it notes often? You can capture and save them into your Evernote with the help of your smartphone. For Android users, tap and hold the plus sign button from any note or notebook, then tap Camera. If you have an iPhone, tap Photos from the home screen or from any note. Snap a photo of your Post-it note and save it to Evernote. In addition, you can assign a default notebook for each Post-it color. Evernote can recognize four colors; electric yellow, limeade, electric blue and neon pink. For example, if you created a ‘Research’ notebook for pink Post-its, Evernote will save them to that notebook when you snap photos of them. Are you a fan of Evernote? 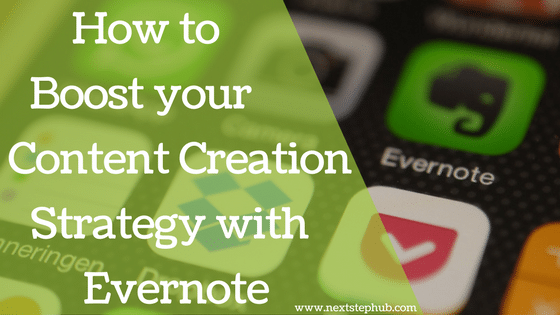 How do you use it for content creation strategy? Tell us in the comments.